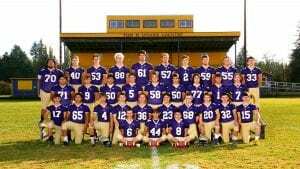 The Central 2B League has long been considered the top football conference in the 2B classification. But if there were still a handful of people who thought otherwise, the state quarterfinals should have been more than enough to sway their thinking the other way. The Central League flexed its muscles during the round of eight as all four games were won by teams for the league – including a trio of schools from Lewis County in undefeated Adna, Napavine and Toledo. 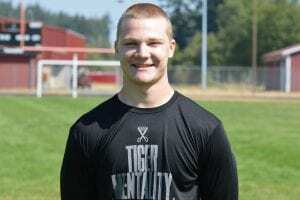 Napavine senior Dawson Stanley was named the Central 2B League’s offensive MVP. Photo credit: Grant Clark. The dominating performance sets up an all-Central League state semifinals with Adna facing rival Napavine and Toledo squaring off against defending state champion Kalama. Both games will take place at Tumwater District Stadium on November 24. The Indians and Chinooks will play in the opener at 1:00 p.m. The Pirates and Tigers will kickoff at 4:00 p.m.
Adna, the top-seeded team in the tournament, improved its record to a perfect 12-0 with a 34-12 victory over Onalaska in the quarterfinals. The win secured a state semifinal berth for the Pirates for the first time since 2013. Fourth-seeded Napavine (10-2) advanced to the semifinals for the fifth consecutive season after besting fifth-seeded Chewelah, 20-14, in the quarterfinals. Adna won the regular season match-up against Napavine, 50-13, on September 28. The Pirates’ ground game was clicking on all cylinders as they rushed for 495 yards as a team on 47 carries against the Tigers. Top ranked Adna will face league rival Napavine in the 2B state football semifinals. Photo courtesy: Adna High School. Junior quarterback Braden Thomas ran for a game-high 167 yards on 13 carries and a touchdown, while teammate Chance Fay also crossed the century mark, rushing for 127 yards on just 11 carries and scoring on runs of 74 and 5 yards. In Adan’s quarterfinals triumph over Onalaska (8-4), Thomas tossed a pair of touchdown passes to senior Brady Collins and ran for an 11-yard TD late in the first half to give Adna a 21-6 cushion at the break. Cole Fay added a 6-yard touchdown scamper in the third quarter and Collins pulled in a 21-yard scoring strike from Thomas early in the fourth to put the game away. Napavine, which lost, 20-13, to Kalama in last year’s semifinals, got three touchdowns from senior quarterback Dawson Stanley (two rushing, one passing) in their victory over Chewelah. Stanley opened up the scoring by hitting Jared McCollum on a 16-yard touchdown pass in the first quarter. Stanley would later score on a 7-yard run in the second before adding the eventual game-winner on a 3-yard touchdown with 5 minutes remaining in the third quarter. The Tigers are seeking their fourth trip to the state title game over the last five seasons. After finishing as the state runner-up in 2014 and 2015, Napavine defeated Liberty of Spangle, 34-16, to win the 2016 state championship. Onalaska saw its football season come to an end in the state quarterfinals. It marks the first quarterfinals appearance for the Loggers since 2002. Photo courtesy: Onalaska High School. This will mark the fourth all-time meeting between the Pirates and Tigers in the state playoffs and the first postseason match-up between the two programs in eight years. Napavine holds a 2-1 advantage in head-to-head state playoff games against Adna, winning 44-35 in the first round in 2010 and 41-34 in the quarterfinals in 2008. 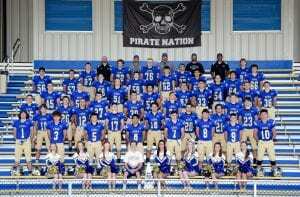 The Pirates’lone victory in the series came in 2009 when they knocked off the Tigers, 27-8, in the quarterfinals before going on to win the state championship. Adna and Napavine were both well represented on the all-league team for the Central 2B Mountain Division. Stanley was named the league’s offensive most valuable player, while McCollum was the recipient of the league’s defensive most valuable player award. The Tigers also had first-team all-league selections in Cade Evander (tight end), Laythan Demarest (wide receiver and defensive back), Ben Woodrum (wide receiver), Hayden Lester (offensive line) Seth Butler (defensive line) and Stanley (linebacker). The Pirates had first-team honorees in Thomas (quarterback and punter), Cole Fa (running back and defensive back), Chance Fay (running back and linebacker). Ashton Dowell (tight end), Collins (wide receiver and return specialist), Ryan Young (wide receiver), Jason Chilcoate (offensive line and defensive line), Abel Ingle (offensive line and linebacker) and Mitchell Maynard (kicker). Adna also had the division’s coach of the year in K.C. Johnson. Onalaska, which advanced to the quarterfinals for the first time since 2002, had a trio of players earn first-team with Ashton Haight (running back), Alex Frazier (offensive line and defensive line) and Tristen Lawrence (offensive line and defensive line). Toledo (8-4) is back in the semifinals following a one-year hiatus after defeating Tri-Cities Prep, 34-23, in the quarterfinals. The Indians raced out to a commanding 27-0 lead at the break against the Jaguars, getting defensive touchdowns from Fano Arceo-Hansen and Jacob Marley. Toledo brings a six-game winning streak into their rematch with Kalama (10-2). The Chinooks won the first meeting, 32-13, on October 5. Kalama defeated Northwest Christian (Colbert), 31-6, in the quarterfinals.